Nursing personnel play an integral role in healthcare and medical delivery organizations. Nurses not only work to keep patients safe, but must also contend with a number of safety and health risks. Illustrating the occupational risks nurses face, Healthcare Safety for Nursing Personnel: An Organizational Guide to Achieving Results addresses healthcare safety as related to nursing personnel risks, hazards, and responsibilities in hospitals and healthcare facilities. The book begins with an introduction to nursing safety that supplies a fundamental understanding of patient, nursing, and facility safety. Next, it delves into the range of safety issues that nurses must contend with. Topics covered include administrative area safety, bloodborne pathogens, workplace violence, infection control and prevention, emergency management, fire safety, and radiation hazards. Examining the concepts and principles of patient safety as related to organizational dynamics, culture, system methods, and key patient safety initiatives, the book supplies essential knowledge of healthcare safety risks, challenges, and controls. It includes information on leadership, management, communication skills, and understanding accidents. The book includes helpful resources in the appendices, such as a nurse safety perception survey, an accident causal factor chart, sample ergonomics symptoms report, sample TB exposure control plan, and a model respirator plan for small organizations. 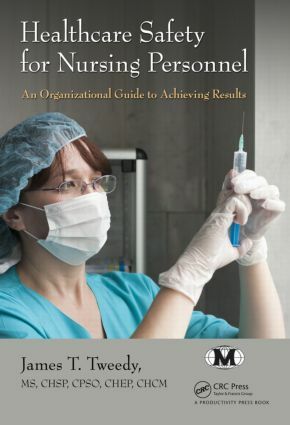 Complete with review exercises in each chapter, this book is ideal for certification training in nursing programs and as a reference for developing nursing in-service safety sessions. Hazardous Waste Operations and Emergency Response (29 CFR 1910.120).